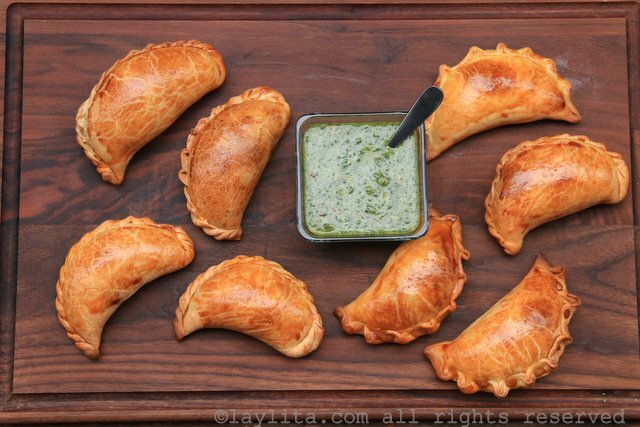 These homemade beef empanadas are made with a delicious meat picadillo filling. 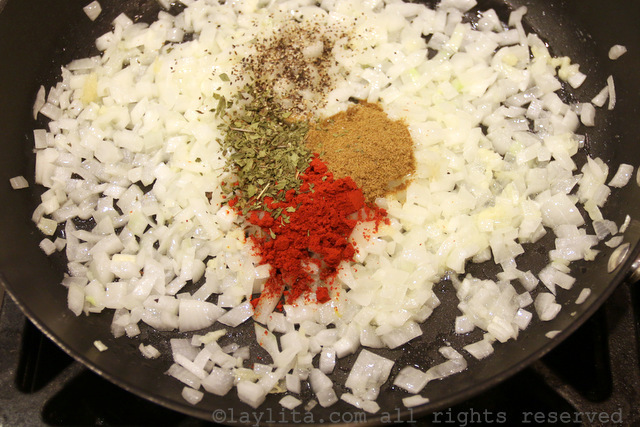 The empanada filling is very simple and contains ground beef, onions, garlic, oregano, cumin, achiote (annatto), salt, and pepper. I have quite of few empanada recipes posted, but realized that I was missing a simple basic beef empanada recipe. 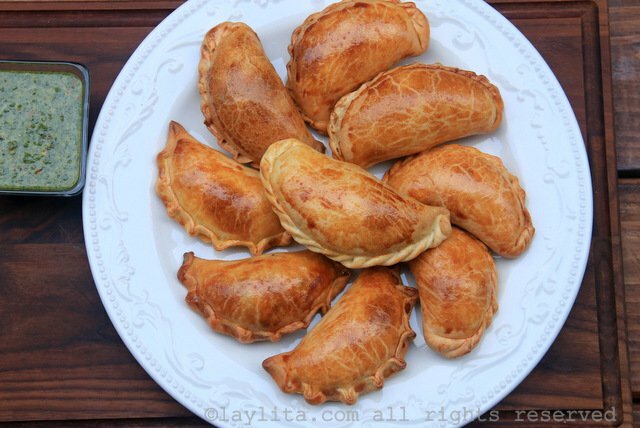 Easy and delicious recipe for homemade beef empanadas, made with a meat picadillo filling of ground beef, onions, garlic, oregano, cumin, and achiote (annatto). 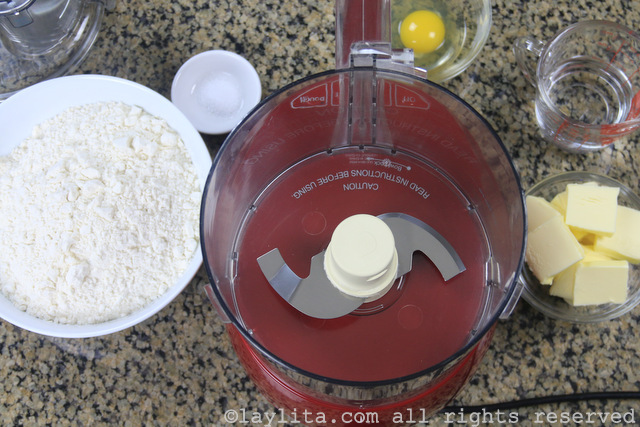 Use a food processor to mix the flour and salt. Add the butter, cut in small chunks, and pulse until mixed. Add the egg and the water (in small increments) and continue pulsing until a clumpy dough forms. To make the empanada dough by hand, follow the same process, but use your hands to mix the ingredients together. Split the dough into 2 large balls; flatten slightly into the shape of disks. The dough can be used immediately or refrigerated until ready to use (1-2 days max). To make the empanada disks, roll out the dough into a thin sheet and cut out round disc shapes for empanadas (use round molds or a small plate). You can also make small individual balls with the dough and roll out each individual ball to a round shape (doesn't need to be perfectly round) - if you have a tortilla press you can use it to flatten the dough balls. You can also see more detailed step by step photos and video preparation of the empanada dough. 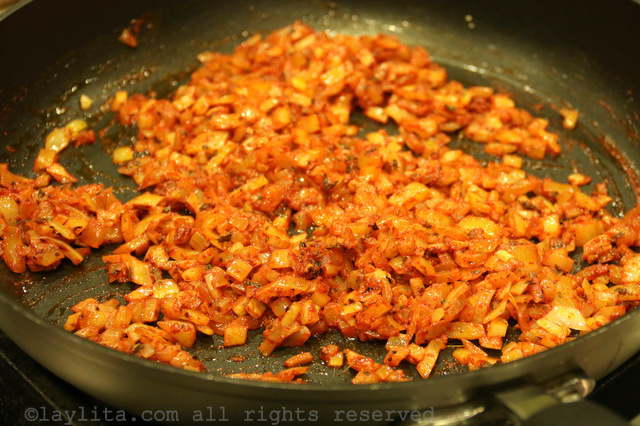 Heat the butter in a large frying pan, add the diced onions and crushed garlic. Cook until the onions are soft. Add the oregano, ground cumin, ground achiote or annatto, and salt/pepper. 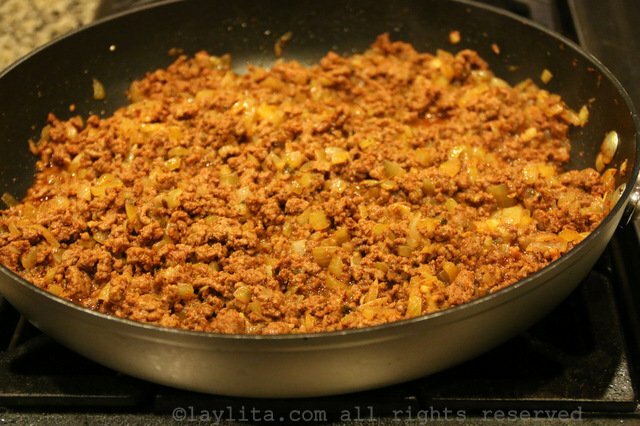 Add the ground beef, stir and cook until the meat is fulling cooked. Taste and adjust salt/pepper and any seasonings to your personal preference. Let the beef filling cool down completely before using to fill the empanadas. 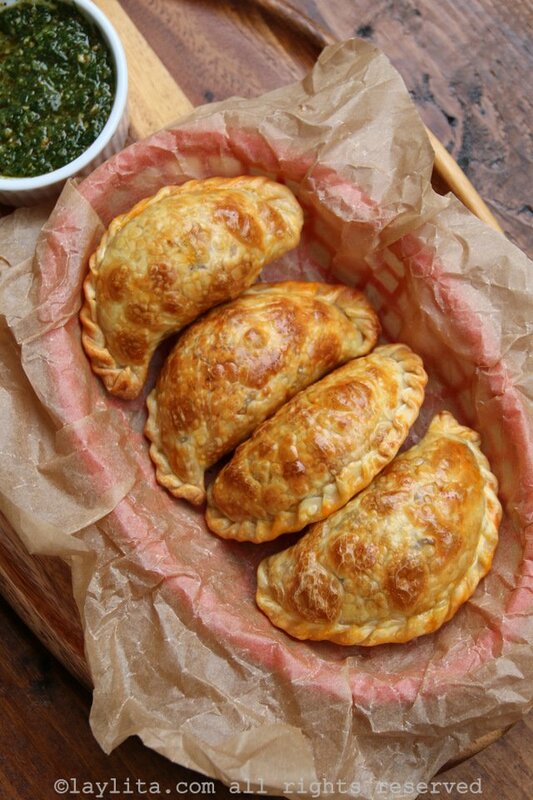 Place a generous amount of the beef picadillo filling on the center of each empanada disc. Fold the empanada discs and gently seal the edges with your fingers. Then twist and fold the edges of the empanadas with your fingers. For extra sealing you can use a fork to press down on the edges. If you have time, refrigerate the empanadas for 30 minutes to an hour, this will help them seal better and prevent them for leaking. You can also prepare them the day before and bake them right before serving. Pre-heat the oven to 400F (200C) for medium sized empanadas, or 375F (190F) for smaller empanadas. Place the empanadas on baking sheet, lightly greased or lined with parchment paper. Brush the empanadas with the whisked egg mix; this will give a nice golden glow when baked. Bake at the empanadas at 400F for ~20 minutes, or until golden on top. Serve warm, alone or with your choice of dipping sauce. There’s something so satisfying about a simple beef empanada. Don’t get me wrong, I love coming up with different creative filling ideas for empanadas. Sometimes I even dream about an amazing new idea for an empanada filling. Then I wake up and write it down before I forget. Of course I don’t always get around to making all of them – but if you just need a bunch of random (and maybe genius) ideas for empanada fillings let me know. The beef filling reminds me of Ecuador, especially because it’s so simple, yet has the flavors of the garlic, oregano, cumin, and achiote that are used in so many dishes. I didn’t add any hot pepper to the filling, but you can feel free to adjust the spices to suit your preferences. 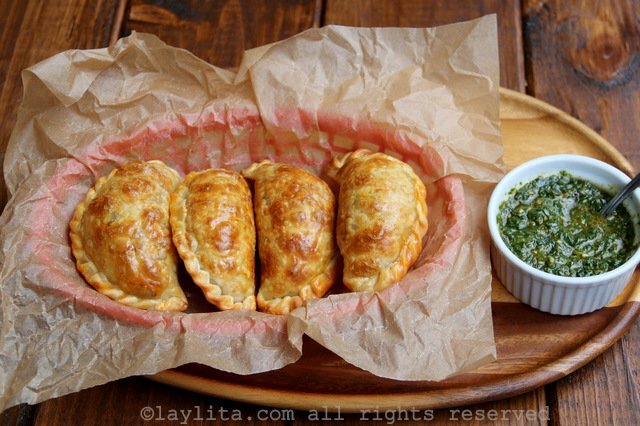 Or serve the empanadas with a spicy aji hot sauce on the side. You can make the empanada dough from scratch or also use the store bought discs. Hello, these sound amazing!! I’m thinking of making them this Saturday but I’m having trouble finding annatto. Any ideas where I can look or substitutes? You can find it a Latin/Mexican stores, even some regular supermarkets carry it (in the spice section). If you can’t find it you can use paprika as a substitute. Thank you for all of the empanada recipes! I went to Spain last summer, and trying to find a true empanada in the Midwest is next to impossible, so I really appreciate all of your recipes and can’t wait to try them! I’m Guatemalan-American; our empanadas are totally different! 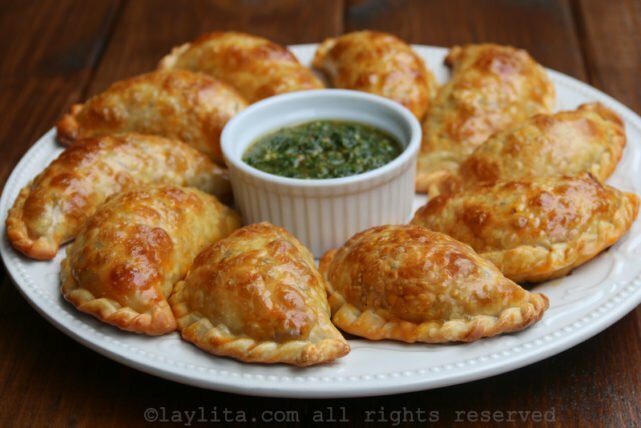 I have been in love with these type of empanadas since moving to Chicago and making friends from all over Latin America– and since finding this recipe less than a week ago, have made this recipe four times! So tasty and adaptable. Thank you! Late to the party here, but we just got back from Ecuador and I have been craving empanadas! I cheated and bought the pre-made dough, but they still turned out very tasty. I plan to make them again and will try making my own dough. The folding tutorial was great and I had no empanada leaks! So glad I found this recipe–thank you! What is the sauce you are using on these? Oh dear ! Simple ingredients always give the best result! Thank you so much ! These are so beautiful Layla! I love that you use annatto in the filling, yum! !